The HubSpot and UberConference integration allows you to schedule UberConference meetings with your contacts from within HubSpot, and keep your UberConference meetings in sync with HubSpot. Use the search bar to search for the UberConference integration. Hover over the UberConference integration and click View integration. In the dialog box that appears, click Connect to UberConference. On the next screen, enter your UberConference credentials, then click Log In. Click Authorize to grant HubSpot access to your UberConference account. Once you authorize access, you will be automatically redirected back to the UberConference settings page in HubSpot. 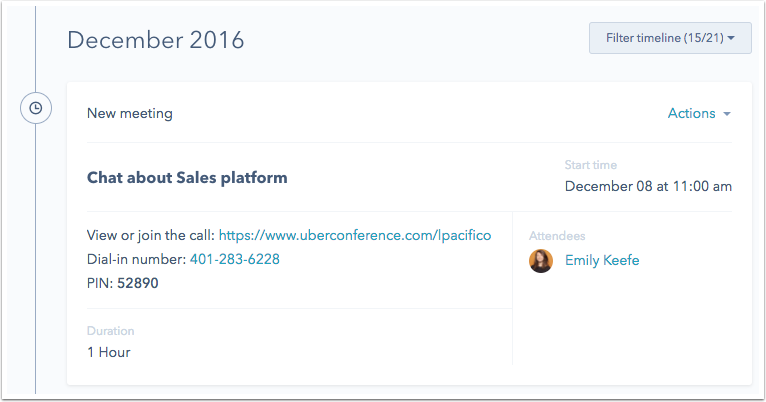 You can now schedule new UberConference meetings with your contacts within HubSpot. You can disable the integration at any time from the UberConference settings screen within HubSpot. In the UberConference card, enter the Date, Time, and Duration of the meeting. You can also choose to add a title and additional attendees. Please note: recurring meetings are not supported at this time. Once the meeting has been created, a success message will appear in the card. 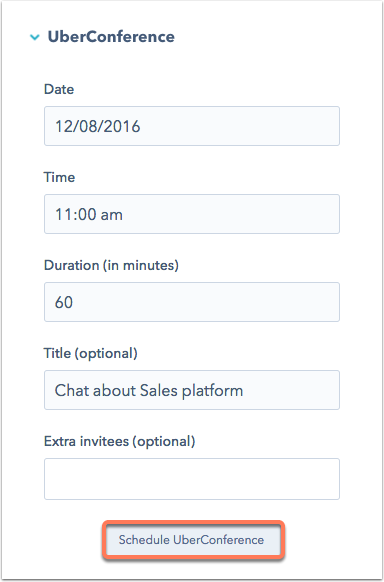 Your invitee will receive an email invitation directly from UberConference, and the meeting will appear on the contact’s timeline. Any UberConferences you schedule with one of your HubSpot contacts will be automatically logged in HubSpot. Updates to meetings will be synced between UberConference and HubSpot every 10 minutes.